With the ubiquity of “value” brands like Kim Crawford, it’s become a no brainer for the average consumer to breeze into a restaurant and order sauvignon blanc. Advanced sommeliers Mick Descamps and Eric Crane during the “I Say, ‘Sauvignon Blanc,’ You Say, ‘Why Not Dry Riesling? '” seminar. Dry Riesling shares many characteristics with sauvignon blanc: plentiful aromatics, fruit forwardness, higher acidity, tropical notes, etc. It’s endlessly food friendly, and it’s damn tasty. Yet, Riesling seems to remain an outcast among white wines, both on restaurant wine lists and in consumers’ minds. 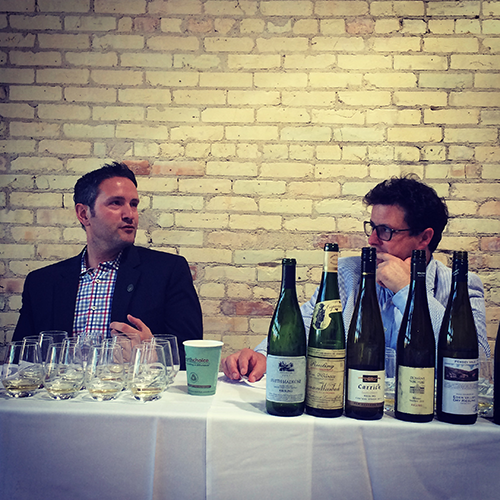 It was a topic tackled with much gusto during City of Riesling, a two-day event founded by Danielson and Sean O’Keefe, winemaker at Mari Vineyards on Old Mission Peninsula. Riesling “geeks” — including sommeliers, restaurateurs, wine writers, winemakers, winery owners, and consumers — converged on Traverse City in late July for the second edition of the educational and entertaining event. The festivities kicked off Sunday with the Night of 100 Rieslings, which gave attendees access to expressions of riesling from throughout the world. Professional sommeliers dispensed tasting notes and background info as they poured samples against the backdrop of Clinch Park, Grand Traverse Bay, and a picture-perfect TC sunset. Wines from mere miles away were juxtaposed with wines from Germany, Austria, Italy, Australia, and beyond. Some were recent vintages; others were decades old. On Monday, the riesling disciples buckled down to more serious business during Salon Riesling, a series of four seminars at The Franklin restaurant downtown. Populated by speakers on various ends of the winemaking spectrum, the panels examined topics like modern versus ancient riesling-making techniques; conventional and “envelope-pushing” examples of riesling around the globe, curated by Stuart Pigott, international riesling expert and author of The Best White Wine on Earth: The Riesling Story; Rieslings of the Great Lakes, including Michigan and Ontario, as well as New York; and the hot-button sauvignon blanc vs. riesling question. On the latter topic, panelists and audience members seemed to agree that Riesling being relegated to the lower ranks of restaurant wine choices is more of a marketing and perception issue — not a taste profile issue. Eric Crane, an advanced sommelier with Empire Distributors in Atlanta, extolled the virtues of both wines. Both, he said, have “antennae” in that they “broadcast from wherever they’re planted,” clearly communicating their terroir through their aromas and flavors. Despite their similarities, riesling has the edge when it comes to subtlety, said Mick Descamps, an advanced sommelier with Red Wagon in Metro Detroit. The ease with which consumers embrace sauvignon blanc, yet shy away from riesling, is indicative of our culture as a whole, argued Descamps. We’re inundated with noise, he said, and “Sauvignon blanc is loud, in your face — it plays into everything else we’re seeing culturally.” Panelists noted that many examples of dry riesling in the past have been so intensely, searingly acidic and austere that they’re inaccessible to the average consumer looking for at least a touch of residual sugar. On the flip side, Descamps also contended that the low quality and “faux rieslings” of his parents’ generation — like Liebfraumilch, Blue Nun, Piesporter Michelsberg — left an unfavorable legacy, furthering the misperception that all Rieslings are poorly made and/or cloyingly sweet. To the contrary, virtually all examples highlighted during the Night of 100 Rieslings and Salon Riesling were dry. For more than a decade, Danielson and O’Keefe had discussed the potential for an event focused on drier styles of riesling, rather than the sweeter versions for which the region had, until recently, been more well known. O’Keefe says the release of Pigott’s book The Best White Wine on Earth: The Riesling Story was the catalyst behind the pair finally bringing the concept to fruition last year. While it wasn’t intended to be a Michigan-focused event, there was plenty of local representation among the Night of 100 Rieslings: both on the panels, which included Black Star Farms’ Lee Lutes, Shady Lane Cellars’ Adam Satchwell, and Left Foot Charley’s Bryan Ulbrich and among session attendees. 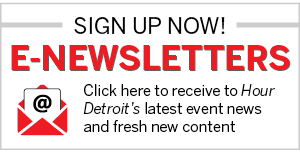 O’Keefe says plans for the 2016 edition are already in the works. For more information on City of Riesling, visit CityofRiesling.com.